As the Twin Cities community marks the second anniversary of Prince’s passing, the artists and staff of the Guthrie Theater, whose own work has been deeply influenced and inspired by Prince’s artistry, will join city-wide community celebrations of Prince’s legacy. 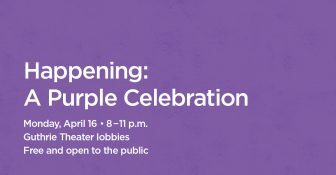 The Guthrie’s A Purple Celebration will feature music, poetry and artistic creations by local artists and community guests as we gather together to remember the legendary artist, Prince. This interactive evening opens with Guthrie Theater artists and staff offering music and poetry inspired by Prince followed by JD Steele, Fred Steele and the Mill City Choir paying their own unique musical homage to the Purple One. The second half of the evening will move into a dance party led by DJ Jake Rudh of MPR’s The Current as he spins Prince tunes and rhythmic grooves.